This Nuveen High Yield Municipal Bond Fund uses its assets to buy lower rated municipal bonds. It is ranked 4-stars rating by Morningstar. It has total net assets of $9.0 billion. The dividend yield is 5.88%. The annual expense ratio of this fund is 0.79%. 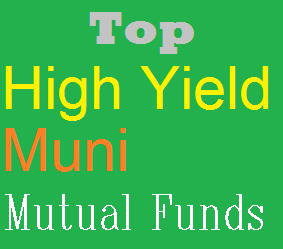 This best performing high yield muni fund has average maturity of 21.83 years. The modified duration is 11.04 years. For 2014, the year to date return is 12.77%. It has 5-year annualized return of 11.76%. The share price is $16.70. Class A fund has a sales load of 4.20%. The top portfolio allocation as of July 2014 is State & Local General Obligation (22.67%), Health (20.33%), and 12.70%. AMG GW&K Municipal Enhanced Yield Fund invest majority of assets in unrated securities and high-yield municipal securities. It seeks a high level of current income exempt from federal income taxes. With total net assets of $233 million, it has 11.57% YTD return. The dividend yield is 3.57%. You can buy this fund with $2,000 minimum initial investment. The total expense ratio is 1.12%. This high yield muni bond fund is ranked with 3 stars by Morningstar. Last year (2013), this bond fund has returned -8.36%. The CUSIP is 00170K604. Other classes are Institutional class (GWMEX), and Service Class (GWMRX). The effective maturity is 15.4 years. The top holdings are Parish of St John the Baptist LA, Grand Parkway Transportation Corp, City of Chicago IL O'Hare International Airport Revenue, New Jersey Economic Development Authority, etc. As 4 stars rated muni bond fund, AllianceBernstein High Income Municipal Fund has a tax free yield of 5.04%. This class A fund has a sales load of 3.00%. The minimum investment is $2,500. The portfolio turnover rate is 41%. With total assets of $1.6 billion, it has returned 8.23% over the past 3 year. Goldman Sachs High Yield Municipal Fund has $3.1 billion of assets. The fund managers are Ben Barber, and Scott Diamond. It has expense ratio fee of 0.87% per year. This fund is open for new investors. The fund objective is to provide high level of current income that is exempt from regular federal income tax. You can buy this top tax free bond fund with $1,000 for your brokerage & $250 for your retirement account. There are 96 brokers offering this fixed income fund. In 2014, the year to date return is 11.22%. T. Rowe Price Tax-Free High Yield Fund uses its assets to buy long-term municipal securities and its weighted average maturity is expected to normally exceed 10 years. The total net assets are $2.9 billion. The current yield is 4.31%. This no load fund has an expense fee of 0.68%. Morningstar has ranked this top high yield muni fund with gold and 4 stars rating. It has a 3 year annualized return of 7.82%. In 2014, the YTD return is 9.11%.